Many people with a Mac computer want to send and receive text messages from their Mac. Most modern OS X versions allow the Mac to use iMessage. However, to send and receive SMS text messages, the Mac needs to be using at least OS X Yosemite 10.10 and you need an iPhone using at least iOS 8.1. 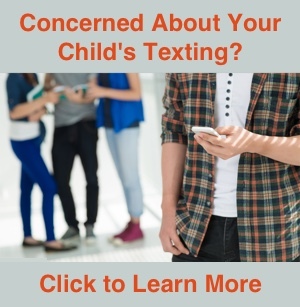 If you are unsure about the difference between iMessages and SMS text messages, this article provides more details. It is basically a three-step process to receive both iMessages and SMS texts on your Mac. Make sure you are signed in to your Apple ID on your iPhone. Setup iMessage on the Mac. Setup the Text Message Forwarding feature on the iPhone to transfer SMS text messages from the iPhone to the Mac. Details for each of these steps are provided below. Make sure you are signed in to your Apple ID in the Messages settings on your iPhone. This will automatically associate your phone number with your iMessage account. Go to a Settings -> Messages -> Send & Receive. Your Apple ID should be visible at the top of the window. If you see a button that says “Use Your Apple ID With iMessage”, tap the button and sign in with your Apple ID and password. To setup iMessage on the Mac, open the Messages app in the Applications folder on the Mac. Once the app is open, select Preferences under the Messages menu in the top left of the screen. 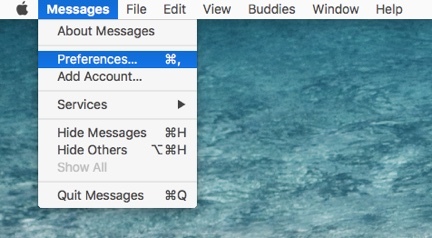 If you have difficulty finding the Messages menu, look to the top left corner of the Mac screen. You will see the Apple logo and the Messages menu immediately to its right. Select Messages and a menu will appear that contains the Preferences option. If your phone number does not appear, make sure you are signed in to your Apple ID on your iPhone under Settings -> Messages -> Send & Receive. You can not receive iMessages from your iPhone number on your Mac if your iPhone is not signed in to your Apple ID account. 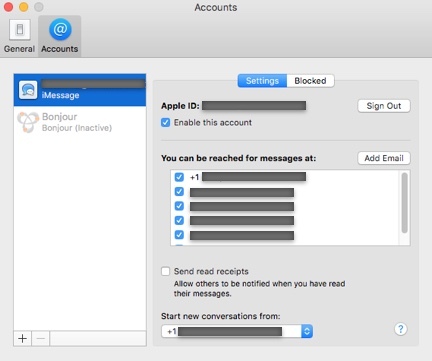 What if iMessages Are Not Received on the Mac? If you are already signed in to your Apple ID on both the iPhone and Mac and iMessages are not being delivered to your Mac, try resetting iMessage on both the iPhone and Mac. 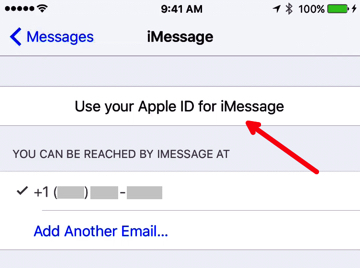 This article explains how to reset iMessage on the iPhone. Reset iMessage on the Mac by signing out of your Apple ID, restarting your Mac, and signing back in to your Apple ID in the Message app Preferences. Once you are receiving iMessages on your Mac, you can then setup the Text Message Forwarding feature on your iPhone to have SMS text messages delivered to the Mac. This article explains how to setup Text Message Forwarding. The article describes setting it up on an iPad, but the processes is similar for the Mac.